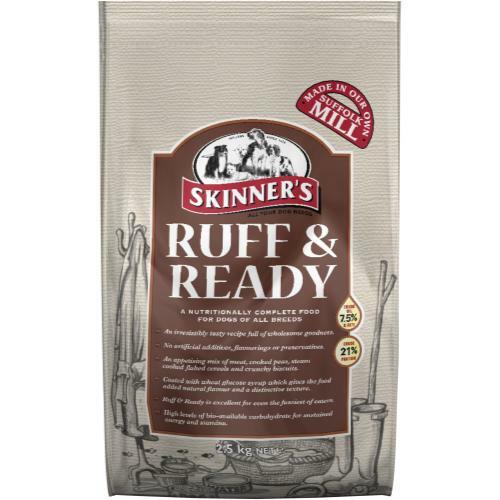 Skinner’s Ruff & Ready is a muesli mix of different flavours and textures that add up to a delicious and complete adult dog food. An assortment of beef, gently cooked peas, steamed flaked cereals, and biscuits, Skinner’s Ruff & Ready is enriched with protein, vitamins, minerals, and all the good things your dog needs to remain happy and healthy. Containing fish, rich in essential fatty acids to keep your dog’s coat healthy and lustrous, Ruff & Ready contains easily absorbed carbohydrates for readily available energy, and the mix is coated in wheat glucose syrup for an tantalisingly succulent texture. Suitable for older puppies and adult dogs alike, Ruff & Ready can be fed either straight from the bag or with a small amount of tepid water to create a scrumptious gravy. Vitamin A 15,750 iu, Vitamin D3 2,290 iu, Vitamin E (as alpha-tocopherol acetate) 150 iu. Trace Elements per kg: Iron (as ferrous sulphate monohydrate) 17.5mg, Iodine (as calcium iodate anhydrous) 2.6mg, Copper (as cupric sulphate pentahydrate) 10mg, Manganese (as manganous oxide) 46mg, Zinc (as zinc oxide) 133mg, Selenium (as sodium selenite) 0.14mg.